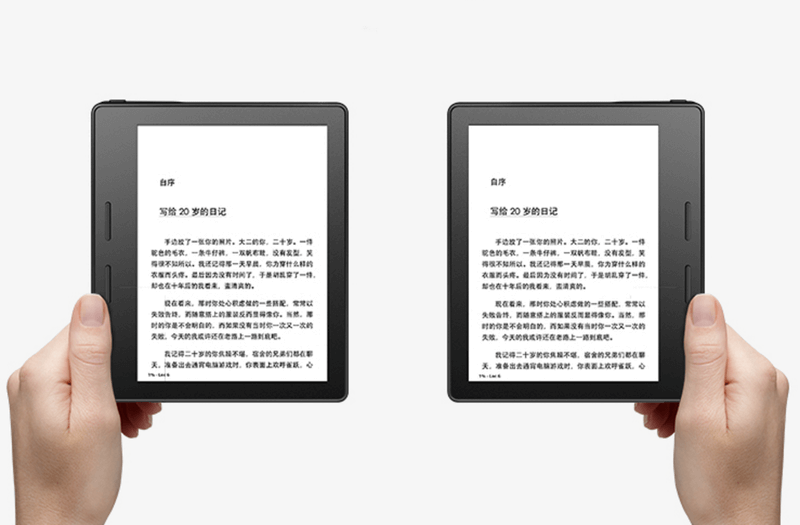 Amazon will soon announce a radically redesigned Kindle reader and details have leaked online on the Chinese website Tmall before Jeff Bezos’ grand reveal. Although the page has since been taken online, the device, dubbed Oasis, will supposedly be the new top-of-the-line model, introducing a wedge-shaped design and a larger bezel on one side of the display with physical page-turn buttons to make it easier to use one-handed. The new design allows you to hold and control the device with either hand from the thicker edge, with the screen rotating depending on its orientation. Screen resolution remains the same 300 pixels per inch as the Kindle Voyage but backlighting should be more uniform when reading in the dark, with Amazon including 60% more LEDs inside. The Kindle Oasis is 3.4 millimeters at its thinnest point and 8.5 millimeters at its thickest, while weighing in at 131 grams -- around 20% lighter than past models. The listing also details a battery case that comes included with the e-reader. It attaches to the Oasis with magnets, giving it up to 20 months of standby time. You can charge both the cover and internal battery simultaneously when attached. One thing that isn’t mentioned on the page is water resistance, an often requested and rumoured feature. With the device being called ‘Oasis’ perhaps not all hope is lost, so we’ll need to wait for Amazon’s official unveiling for news in that regard.